If you are a parent, you may be wondering when can a child safely sit in the front seat of your vehicle. Very young children should travel in the back seat in appropriate car seats, since the airbags that are meant to shield adults in a car crash can be a safety threat to them. According to Edmunds.com, motor vehicle accidents are responsible for the death of nearly 2,400 children each year. Another 270,000 youngsters are injured annually. Car accidents are the leading cause of death for children under the age of 14. Most accidents occur relatively close to home (within 25 miles of the child's residence). Speed is not a factor in most cases, with the majority of accidents happening on roads where the posted speed limit is 40 mph or less. When a car accident occurs, children are much safer and less likely to be injured if they are properly secured in the back seat. If the collision is head on, a child can strike the dashboard of the car or even be ejected from the vehicle through the windshield. During this type of incident, there is also a risk of objects entering the vehicle through the windshield, and a child who is in the front seat is at a higher risk of injury because of this fact. Passenger-side air bags are designed to shield adults when an accident occurs. They deploy with enough force during a collision that they can cause head and neck injuries in young children. Keep in mind that this safety feature was designed to protect an adult. When they activate, the airbags are inflating at the rate of 200 mph. 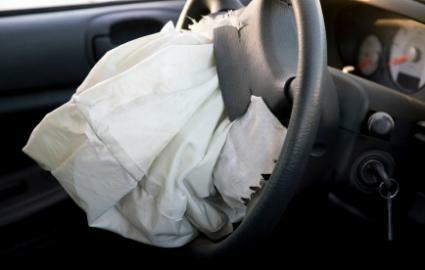 The airbags may deploy even in relatively minor accidents that do not involve high rates of speed, and in some cases, the injuries caused by air bags have been fatal. A child using a rear-facing car seat in the front seat is at higher risk for injuries because of the proximity of the back of the seat to the airbag. When Can a Child Safely Sit in the Front Seat? A child can safely sit in the front seat once he or she turns 13. By that age, they are tall enough to be able to be protected by an airbag, instead of threatened by this safety device. In a situation where a parent must transport his or her child in the front seat of the vehicle before they have reached 13 years of age, the airbags should be disabled first. If the car is equipped with a manual cut-off switch, use it before allowing the child to enter the vehicle. You should also move the passenger seat back as far as it will go before placing the child seat in the vehicle. The youngster should be secured in the front seat using a lap and shoulder belt and instructed not to lean towards the dashboard of the car. The safest place for a child to be in a vehicle is in a properly-secured car or booster seat in the middle of the back seat of the vehicle. For an infant or a child under 12 months of age, a rear-facing car seat must be used. This device is designed to cushion the child's head and neck if a collision occurs. The question of when can a child safely sit in the front seat is an easy one to answer. Children under the age of 13 should ride in the back seat, even if you are only going to be driving for a short distance. Since most accidents occur close to home, it's the safest approach for your child.